One of the questions we are often asked is whether we’re able to provide an instant price via email or over the phone. Most of us like to get a good idea of what sort of budget is appropriate but more importantly, we also need an idea of the difference in value – especially if we’re looking at making a long term investment on something as important as our home or investment property. As an example, a sliding window can cost anywhere from around $300 to $3000+ because of the massive variations in size, glass, installation requirements and customisations. Of course there are many types of windows and doors available with multiple combinations of options and configurations. If you’re looking for window and door prices, the best thing to do is have a read of this blog article, then contact the right supplier for you. Why don’t many people publish window and door prices online? As you’ll see, there are quite a few factors involved and it might make you think twice about going ‘off the peg’ with new windows and doors. 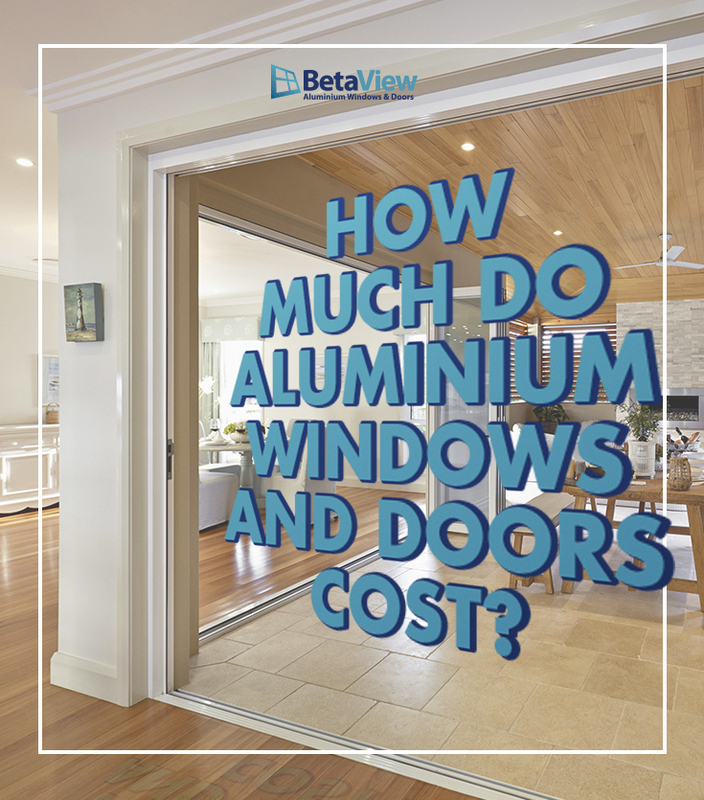 Like most quality window and door companies do, BetaView custom make every single window and door. If you need something really basic, like for a shed or garage, you can normally pick up a basic window in a standard size from stores like Bunnings, and either install it yourself or call in a handyman. However, when it comes to your home, the benefits of a properly sized window or door, and the correct installation thereof, is critically important. When price lists are published online it usually means the window is prefabricated. In most cases, especially in replacement and renovation work, it’s very difficult to get a true fit and often this leads to hacking the opening and/or product to fit the space. This often leads to serious problems, leaks and may require the product to be remanufactured, which is of course a costly exercise. Before discussing pricing it’s important for you to have a clear idea of your requirements in certain key areas. The benefit of this is that you’re able to make a more informed decision about any quotes you receive – whether that’s from BetaView or another supplier. Supply Only vs Supply & Install – How to choose? The first thing to determine is whether you need Supply Only or Supply & Install. Most window and door suppliers will only supply windows and doors to you. Typically, this means you will need to undertake measuring, complete a window schedule, define your requirements and decide on the most suitable product. Then you’ll need to seek out a qualified and professional installer – normally an experienced builder or carpenter – to remove your old windows and doors and fit the new ones. Don’t waste your time with the wrong type of supplier. If you need or even think you might need installation, seek this out as your first requirement. Next, you’ll probably want a confirmed in-home appointment where you’ll get to have a proper conversation with an expert. This should be an opportunity to explain what you’d like to achieve as well as the time to get a comprehensive on-the-spot quote. You should also consider the grade of windows and doors that you require. In domestic applications this is either Residential or Semi-commercial. Commercial grade products are normally over engineered for normal home use and can often be very heavy to open or close. In some situations, where very large openings are required, a commercial product may be suggested. Ensure the product range suits your desired objective. Some manufacturers specialise in certain material – like timber or aluminium. Finally, make sure your supplier is experienced, registered and a member of professional bodies like the Australian Window Association, Master Builders Association and displays the official Australian-made logo. Unfortunately, there are a lot of cheap imports and fly-by-night suppliers out there. They should be able to prove their existence and have been established for a good period of time. This offers you extra protection, and they should also provide a warranty and, if required, home liability insurance. While some suppliers help with explaining the basics, it’s quite common that industry jargon and technical info all too often bamboozles consumers. This is due to the industry typically gearing itself toward builders and architects, rather than end-users. Make sure that when you receive a quote the supplier is able to explain the inclusions and exclusions. Many quotes are quite complicated and difficult to understand. Manufacture of new windows, as measured for that specific supplier in your home. Sometimes sizing can vary and without a proper understanding of the product and the building, incorrect measurements can lead to serious problems. The grade of products: Domestic, Semi-commercial or Commercial and why that level has been suggested for your application. If required, how will any extra work be organised, like organising cranes for hard to access areas, plumbers, electricians, etc. Like in any decision making process, you need to feel confident and understand the whole picture to make the right decision. If the information you receive doesn’t feel complete or the supplier is disorganised and hard to contact, it’s likely this is how the rest of the job will go. Bear in mind, that although windows and doors are an everyday thing, they are a significant component of the home. Be sure you’re dealing with reputable, safe and professional suppliers for both manufacture and installation as the results can vary drastically.